This is my first serious season of HPDE’s, after having just a rain-free morning in my one event last year. I started this year at Putnam Park, a great learning course that gives you a little time to think between most curves, and a large beautiful lawn around most of the track in case you run off. People also suggested Grattan as a learning course, so my son Aric and I signed up for a two-day-er this June with the Rally Sport Region of the PCA, I with my ’07 Cayman S, and he with his ’09 Solstice Coupe. For those unfamiliar, Grattan is one of the most challenging road courses in the US, with between nine and twelve turns (depending on whose track map you believe) packed into an official 2.0 miles. There are few “normal” curves on the track. I’d call Turns 2, 3, 8, 9, 10, 11 and 12 blind, and apexes for the rest are obscured. A few drop away sharply. There’s a hump before Turn 5 that will completely unload your tires, but then highly load them right before the turn. Turns 5-8 come at you pretty fast, so there are a lot of compromises, and little opportunity to recover from mistakes. So you do learn a lot really fast, out of necessity. 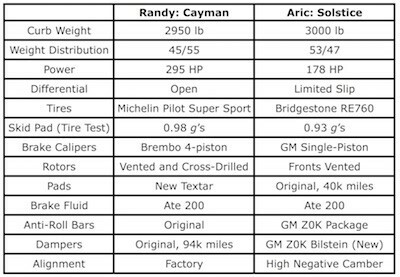 This was Aric’s first HPDE, so I hoped he’d do OK with all the complexity. We had set his car up well for handling, with GM’s stiff Z0K club sport springs, anti-roll bars and shocks, a good amount of camber, and got some moderately aggressive tires for it. He also had a limited slip diff. I had every other advantage, though - 120 more HP, stickier tires (0.98 vs. 0.93 g’s, per tirerack.com), and much bigger brakes. His brake rotors left a lot of open space inside those 18-inch wheels. I didn’t want to show him up too bad. It was Father’s Day, after all. In my book, Physics for Gearheads, I write that “not going slow is more important than going fast.” What I mean is that the slow parts of the track take a much longer time to cover, so small increases in speed there cut more time, per foot, than big increases in the fast parts. I used lap time simulations to show it in the book, but I didn’t have real data to support my point. I was able to prove myself right at Grattan, at a cost to my pride. Being that Grattan is a short track, I figured it was likely that we’d see each other at some point, preferably with me catching him. But we never did the whole first day. So I figured the kid must be doing pretty well. His instructor was enthusiastic about his performance - he didn’t drive like a novice, and was hitting every apex. So I informed him that if he got better lap times, or God forbid he passed me, he would be disowned. Peter Krause had set me up with a Solo DL this spring. I used it in sessions 2 and 3 of our second day, doing a best lap of 1:43 – fairly respectable, I thought, for the first time there. 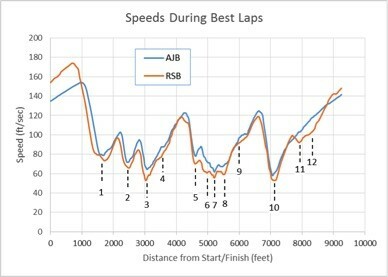 (However, there was a funny offset in the data, so I’m using my slightly worse 1:44.7 lap in the following plots). Aric recorded his 4th and 5th sessions. When we pulled in after the 4th, I looked over to his car and said “Well, should I be proud?” His instructor said, “Of yourself, or your kid?” I answered that I guess I should want to be proud of the kid. He said he ran a 1:37. I didn’t want to be that proud! So let me show you how Aric (AJB) put the dent in my alpha male status. Our speeds vs. track position are in the first figure. You can see my horsepower advantage on the front straight, topping out at 175 ft/sec (119 mph) to Aric’s 155 ft/sec (105 mph). But you can see how he goes deeper into Turn 1 before braking. Throughout most of the track, he has a small advantage. At least it looks small here. But there’s a more insightful way to look at this. Instead of speed v, which is how many feet of track you cover each second, I like to look at “slowness” 1/v, how long it takes you to cover each foot of track. After all, you have so much track to cover in a lap, and if it takes less time to cover each foot of it, you’ll have a shorter lap time. Another term for slowness would be “time consumption,” how much time you consume for each foot (if someone has a better name, I’m interested in hearing it). 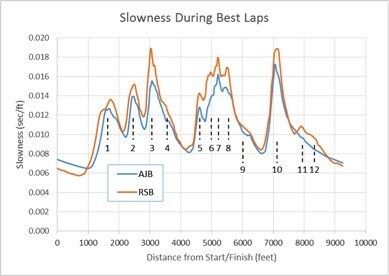 If you are significantly “less slow,” for a significant length of the track, you can accumulate a big advantage there. So the second plot compares our slowness. For reference, note that at the 1200-ft mark, where I’m going 100 ft/sec in the first figure, my slowness is 0.01 sec/ft – it takes me 1/100th of a second to cover one foot. My large advantage in speed on the front straight doesn’t look so large now, does it? It doesn’t take either one of us very long to cover a foot of track at that point, so cutting it down by going faster doesn’t do me much good. In fact, my braking too early going into Turn 1 wipes even that out. But the slower turns are what really did me in. Going through Turns 5-6-7-8 takes us something like 0.015 seconds per foot, twice as long on the straight. So when Aric takes that sector in 10% to 15% less time than I, it results in a big chunk of time cut. This explains our lap times much more clearly than Figure 1 did. In fact it makes it obvious. If you think it through the rest of the way, you’d find your lap time by simply adding the time it takes to cover each foot, over the entire length of the track. Visually, it’s the area under the slowness curve. 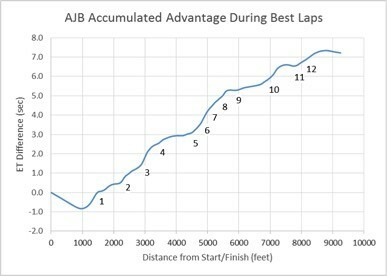 When I did this, the areas under the curves did indeed equal the lap times on the recorder. Looking closer at other data channels explained how he did it. He did an excellent job of staying near the edges of his car’s performance envelope, close to maximum possible acceleration laterally, longitudinally, or a combination (just like you’re supposed to). But in case you think he was muscling the car through the corners, his tires showed no wear or scuffing after two days. And his tire pressures only went up 4 psi during each run, while mine when up 10! In our last session, I did finally see him, coming up behind me. I waved him by, and watched him go smoothly through Turns 5-8. Beautiful, really. Fast, but fluid. Why didn’t I do as well? One of my problems was lack of confidence in the car’s handling. It didn’t feel glued down, even with good tires. I think my old struts were allowing too much bobbing and weaving, and the factory alignment was allowing the tread to roll over too much. It’s hard to be consistent without confidence. And the sun was in my eyes. The whole way around the track. Obviously, I can’t take this lying down. We’re going to GingerMan somewhere around the time you read this, by which time my old struts and springs will be changed out for coil-overs with stiffer rates and adjustable damping. I’m also dropping it an inch, and having both ends aligned for more camber. Once I drive that, I’ll fine tune with anti-roll bars. Not only should that improve the car, it should improve the feel, and my driving. This was all going to wait until winter, but you can see this has become urgent. But I don’t feel too bad. After all, hardly anyone else passed me unless they had a significantly faster car. It’s just that Aric outdid us. And I didn’t disown him, because I figured that if someone’s going to show me up on Father’s Day, it might as well be my son. After all, he does listen. I had taught him that not going slow is more important than going fast.